Don't be put off by the size of this book as it's so gripping you'll be through it in a flash. THE EXCEPTION has already won the Danish equivalent to the Booker Prize and was shortlisted for this year's Duncan Lawrie International Dagger. 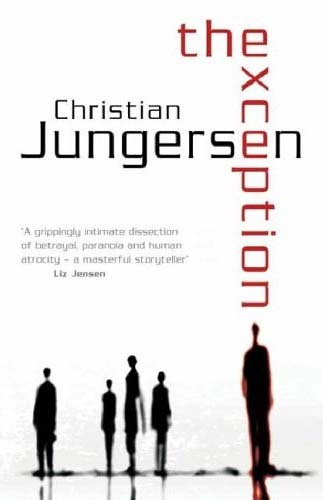 Much of the action in THE EXCEPTION takes place in the Danish Centre for Genocide Studies in Copenhagen where the staff comprises Iben, Malene, Camilla, Anne-Lise and their boss Paul. Iben and Malene are old friends, Camilla is Paul's secretary and Anne-Lise is the new librarian who works in the library adjacent to the main office, called the 'Winter Garden', where the others work, but the door is closed between the two rooms due to draughts. Iben and Malene are the first of the group to receive threatening emails, after work hours. Iben panics and flees her flat but Malene is less concerned. Eventually they think that the sender is a Serbian war criminal who is unhappy with their articles about him. However the pair's suspicions soon focus nearer home and they believe that their new colleague Anne-Lise could be behind it all especially when she reveals how much the hates working with them. The office becomes an arena where alliances shift and underhand pranks, snide remarks and snooping is commonplace. The chapters alternate between the viewpoints of Iben, Malene and Anne-Lise with Camilla chipping in near the end. The women also intersperse their accounts with extracts from the articles written by the Centre about horrific genocides and the psychology of evil. This is an absolutely fascinating read, as well as the suspense element there's also much to be learnt about man's inhumanity to man. As the point of view shifts so does your sympathy for each narrator, at least at first, until it becomes clear that something nasty is going on and that at least one of the women's lives has become a misery. THE EXCEPTION is an intelligent piece of writing that works on many levels and much as I love Fred Vargas's work I am surprised that THE EXCEPTION didn't win this year's International Dagger. It must have been a very close call.